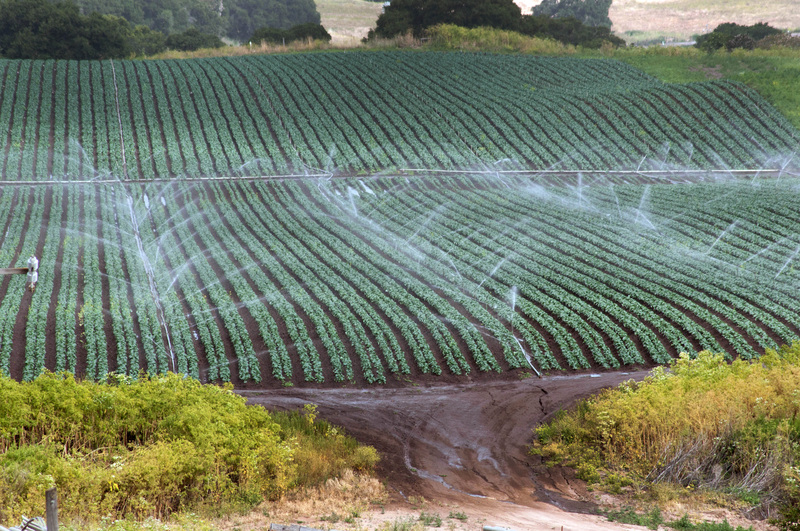 Conventional sprinkler irrigation at Leafy Greens, operated by farmer Tom Heess, in the Salinas Valley of California on Thursday, June 16, 2011. Leafy Greens grows row crops of lettuce, broccoli, cauliflower sweet peas and seed beans. He uses rotational crop plantings to control weeds and plant disease. When a plot of land is at rest, he plants a cover crop of barley and rye grass because the roots hold the topsoil reducing erosion of the soil. He is converting his irrigation system from conventional sprinklers (seen) to micro irrigation. Where one system produces runoff and erosion of the soil (seen in foreground); the other has little or no erosion, less maintenance, easy harvest and less water is needed. When seasonal rains produce runoff, the silt that flows with it is caught in sediment ponds (left and right of pathway). The ponds have grass, bushes and trees to hold the structure and allow the silt to settle. Spillways lead to holding ponds and eventually the Salinas River, a tributary of the Monterey Bay National Marine Sanctuary. So far, because of its design and efficiency, no water has made it to the river. Photo by U.S. Department of Agriculture.